Eliminate Full Price: Ice Cream Craving Fulfilled! 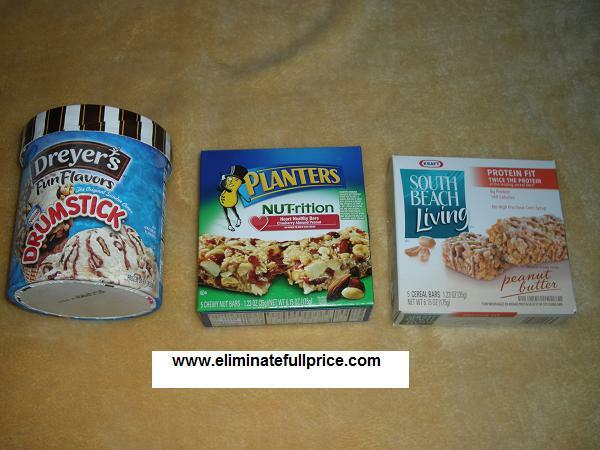 Got 1 Ice Cream & 2 boxes of cereal bars for $0.75! Ice Cream Craving Fulfilled! Got 1 Ice Cream & 2 boxes of cereal bars for $0.75! I had a sudden craving for ice cream. I made it my mission to get some today. I also wanted to get cereal bars because they're on sale at CVS this week. Plus I earned $1.00 Extra Care Buck from it being my 4th green bag tag & $1.00 Extra Care Buck for buying 2 boxes of cereal bars. I earned a total of $2 Extra Care Bucks! $8.50 total without coupons/discounts - $0.75 total with coupons/discounts = $7.75 full price eliminated! Hi, I found your site when I was looking for news about the bsb .. wanted to buy the vip platinum in the concert they will do in Brazil. was wondering if you can explain to me how, if they are legal and are really worth buying the VIP, because $ 500 is more than 1000 real (Brazil's money). I count on your help, thank you! Thank you for your comment on my website eliminatefullprice.com. Buying platinum VIP is legal if you from it from backstreetboys.com. In 2010, I did platinum VIP 3 times. Only buy it if you have extra money on hand and it won't make you go into debt. It is very expensive and a huge investment. -Watch Backstreet Boys answer questions from the fans. Each Backstreet Boy answers 1 question which is a total of 4 questions. If you want to ask them a question you have to raise your hand very fast and be very close to Justin from the fan club. -A backstage tour with 1 Backstreet Boy. You don't know who gives the tour until the day of VIP. The tour is about 15 minutes and the Backstreet Boy shows you and the other platinum VIPs backstage. -After the backstage tour, the Backstreet Boy who gives the tour autographs everyone's platinum VIP pass. Depending on the mood of the Backstreet Boy, you either get a picture with the Backstreet Boy by yourself or a group picture with all the platinum VIPs. For my platinum VIP with AJ and Howie, they didn't take pictures with each platinum VIP fan. The only took group pictures. For my platinum VIP with Nick, he took a picture with each fan. I think platinum VIP is worth it if your favorite Backstreet Boy gives the backstage tour. I had a great time when Nick was the backstage tour guide because he's my favorite. If you don't care about the backstage tour then consider doing gold VIP. I've done gold VIP before and the only differences are there's no backstage tour and no extra year of the Backstreet Boys fan club. I hope this helps you decide on whether or not to buy platinum VIP. Let me know if you choose to do platinum VIP. I'd love to read about your experience and know which Backstreet Boy gives the backstage tour.